A 30 year old patient Ms. Manisha Kumawat, resident of Jaipur, was unable to see from her right eye for the last 2 years. She consulted an ophthalmologist who recommended to undergo a CT scan; however she never had any headache or neurological problem but the reason for her losing the vision was not found through routine eye check. CT scan confirmed brain tumour and was advised to consult a neurosurgeon. Since she had no symptom of headache it came as a shock for Manisha as well as her family. She consulted a few neurosurgeons and was referred to Narayana Multispecialty Hospital, Jaipur, where she was admitted under Dr. K.K. Bansal, Consultant & HOD Department of Neurosurgery. 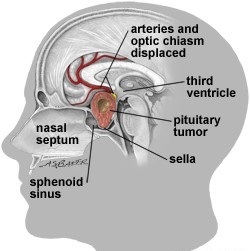 The biggest challenge in such surgery is that the optic chiasm can be damaged during surgery & if vision problems were present before surgery, decompression may not restore normal visual function. The nerve may have been permanently damaged by the tumour. But our skilled neurosurgeon and team successfully removed the tumour restoring the vision of the patient.